Glaucoma is an eye disease that is most commonly caused by an elevated pressure inside the eye-Intraocular Pressure (IOP)-that damages the optic nerve and causes loss of vision. Glaucoma can begin without any symptoms or obvious loss of vision and if not diagnosed early, treated properly and controlled, it will result in permanent vision loss and potentially blindness. There are two main types of Glaucoma: Primary Open Angle Glaucoma (POAG), and Angle Closure Glaucoma. The most common type of glaucoma is Primary Open Angle Glaucoma (POAG) whereby the production and/or drainage of fluid inside the front of the eye-called aqueous humor-is imbalanced, resulting in an elevation in eye pressure (IOP) so that the circulation in the optic nerve becomes compromised, depriving it of oxygen and nutrients causing permanent changes and even damage to the optic nerve, which if left untreated result in vision loss and ultimately blindness. 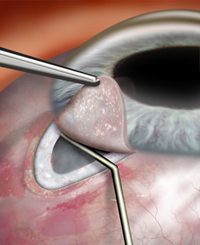 The second type of glaucoma is called Angle Closure Glaucoma. Primary Angle Closure Glaucoma accounts for about 10% of all cases of glaucoma and about 2/3 of these produce no symptoms for patients. Acute Angle Closure Glaucoma is one of the only types of glaucoma that produces distinct symptoms that include pain, light sensitivity, redness, blurred vision, colored haloes around lights and nausea or vomiting. Acute Angle Closure Glaucoma is considered a medical emergency. If you experience a sudden onset of pain, redness, blurred vision, light sensitivity, haloes around lights, nausea and vomiting, please call Northwest Indiana Eye & Laser Center at 219-464-8223 and relay these symptoms to the receptionist so that you can be given an appointment immediately. In the event that you are at risk for Angle Closure Glaucoma or in the event that you have Acute Angle Closure Glaucoma Dr. Scott Buck may initially prescribe some medication to begin to lower the pressure but will also perform a type of glaucoma laser procedure called Laser Iridotomy or “Laser PI” to produce a small opening or hole in the Iris so that Aqueous Humor can drain from the eye more effectively. High Intraocular Pressure•	Age-Risk increases after the age of 40 and is 6 times greater if you are over 60. Race-African-Americans have a six to eight fold increased risk for glaucoma. Myopia-Severely nearsighted people have a higher risk of developing glaucoma. Family History-Any family history of glaucoma is considered a very significant risk factor. Ophthalmoscopy-Examination of the optic nerve through a dilated pupil. Optic nerve exams can be performed using special instruments or a high magnification lens with the Slit Lamp. Visual Field Perimetry-A computerized examination to plot an actual map of the field of your vision. Gonioscopy-We directly view and examine the drainage structure of your eye-trabecular meshwork-using a special mirrored contact lens. Imaging of Optic Nerve & Fibers-OCT uses a method called “optical coherence tomography” to create digital images with beams of light to examine the optic nerve and measure the retinal nerve fiber thickness. There are three main methods that Dr. Scott Buck can use to treat glaucoma including medical, laser and surgical treatment of glaucoma. Primary Open Angle Glaucoma is at first most often treated with eye drops. By using one or two types of glaucoma eye drops most patients are able to achieve a stable and lowered eye pressure. Some patients are unable to achieve adequate control with eye drops alone, or may experience intolerable side effects from the eye drops, and do better with an in office glaucoma laser treatment to maintain control. 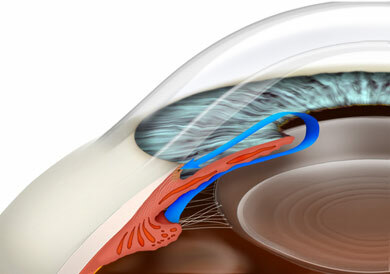 Selective Laser Trabeculoplasty (SLT) is a type of glaucoma laser treatment that helps to reduce the Intraocular Pressure (IOP) by creating more effective drainage of fluid through the trabecular meshwork. We perform this painless procedure in the comfort of our office and often patients are able to obtain good stability but also reduce the number or frequency of eye drop instillation. For some patients even with the maximum eye drop medical therapy and glaucoma laser treatment it is still not possible to achieve good stable control of their disease and stop the progression of vision loss. For these patients glaucoma surgery may be an option and can include removing a tiny piece of the trabecular meshwork, or even implanting microscopic tubes, shunts, valves or stents to help reduce and stabilize the Intraocular Pressure (IOP) and prevent vision loss. Cataract patients with glaucoma have an additional treatment option called the iStent® Trabecular Micro-Bypass Stent. During your cataract surgery, Scott Buck, M.D. can implant this microscopic device as a treatment option to reduce eye pressure for cataract patients with glaucoma. With iStent® many patients will need to use fewer eye drops for their glaucoma treatment and might not need to use prescription eye drops at all.